The Blot Says...: Coming Soon: DC Comics Dunny Collection by Kidrobot! Coming Soon: DC Comics Dunny Collection by Kidrobot! The Blot was flabbergasted to learn earlier this week that Kidrobot will be releasing an entire collection of officially licensed DC Comics Dunny vinyl figures! This is the first time ever Kidrobot has released a Dunny collection of officially licensed characters, and it’s garnering some really mixed reviews from the designer art toy scene. 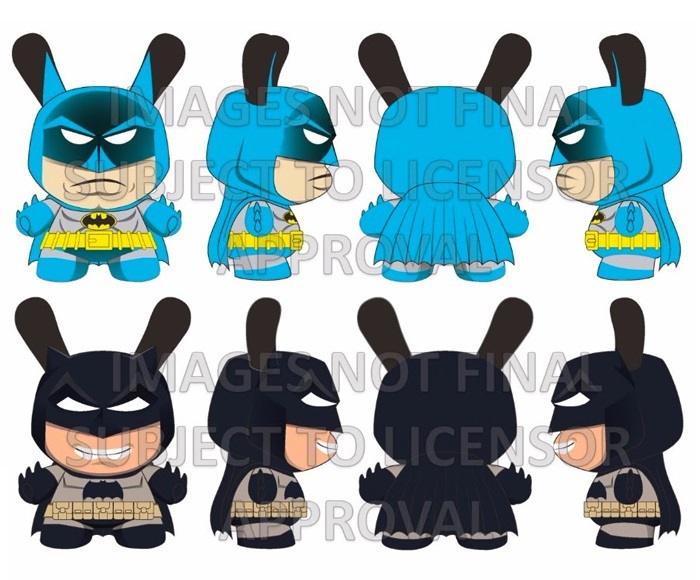 While I’m sad to see the iconic designer art toy platform move in this direction, a Batman Dunny Series is really not that big of a change from KR’s recently released Andy Warhol Series. But at least that collection was an artist series dedicated to his body of work. Batman Dunny Series: Holy Dunny series, Batman! Kidrobot and DC Comics are ready to defend Gotham City with this all new Batman Dunny Mini Series. This series features the most iconic versions of Batman as well as a variety of villains ranging from the movies, TV shows and comics molded to fit the classic Dunny platform. Grab your utility belt, collect all 15 and complete your Bat Cave collection! The series includes Batman, Dark Knight Batman, Classic Batman, Robin, The Joker, Hush, Batgirl, Harley Quinn, The Penguin, Red Hood, Bane, Two-Face, Catwoman, Black Mask and The Scarecrow. Justice League Dunny Keychain Series: In time for the new Justice League movie, Kidrobot and DC Comics have teamed up to shrink the Dunny down to small crime fighting size. 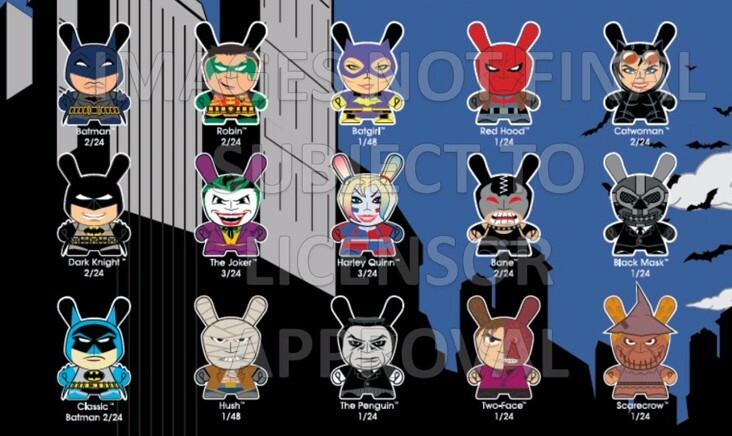 Featuring all of the DC Universe's most iconic heroes and clocking in at 1.5” tall, these Dunnys are ready to stop villains in their tracks. Coming with a lobster clasp on a detachable ring, this Justice League adds a heroic accent to backpacks, purses, keys and zippers. The series includes Batman, Classic Batman, Superman, Wonder Woman, The Flash, Green Lantern Hal Jordan, Cyborg, Aquaman, Blue Beetle, Booster Gold, Animal Man, Zatanna, Green Arrow and Green Lantern Guy Gardner. Batman Dunny 5” Vinyl Figures: Not to be outdone with just a mini series, DC Comics and Kidrobot are adding a one-two punch with 2 new Batman 5” Dunnys. Depicting The Dark Knight’s classic blue and gray costume and his most recent New 52 costume, these two Batman Dunnys are a must have for any fan of the Caped Crusader! 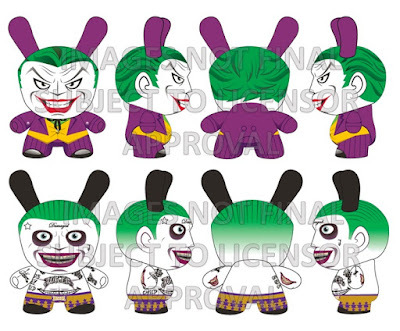 The Joker Dunny 5” Vinyl Figures: What is Batman without his greatest villain? In conjunction with the release of two Batman 5” Dunnys, DC Comics and Kidrobot have added a barrel of laughs with 2 new Joker 5” Dunnys - one featuring The Joker in his classic purple suit, while the other features The Joker’s look in the recently released live action Suicide Squad movie. Featuring the latest and greatest incarnations of Batman's arch enemy these two pieces are sure to add a bang to any collection!